In a fantasy universe only moderately skewed from our own, the Pope wields a power our world can only dream of. 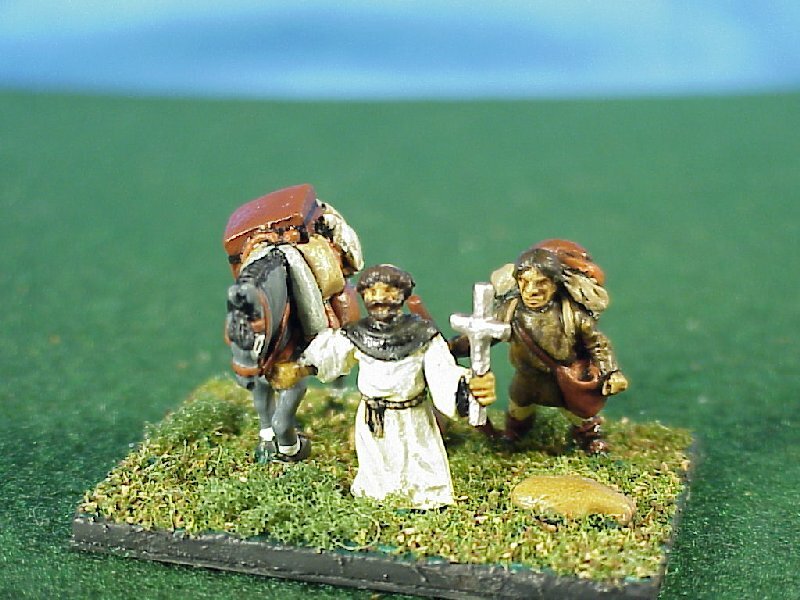 When the faith of the clergy commands the loyalty of men and beasts, people of truly heroic proportion can come forth. 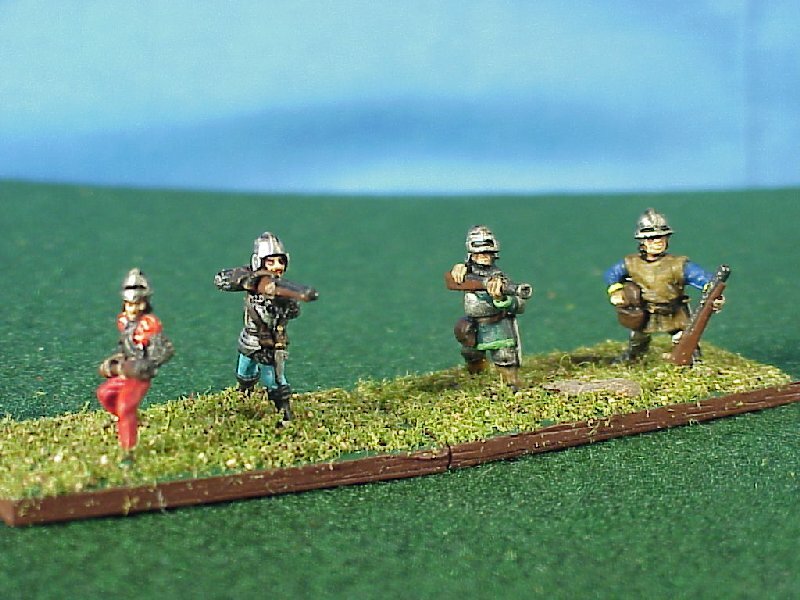 The army consists primarily of conventional troops, mostly Knights and some foot troops. It can easily be fielded at anywhere from 24 to 48 points, and can be configured to have between 9 and 12 elements at the 24 point level, including an option for the dread Aerial Hero. The General of the troops, a Knight of great renown. He bears the Lion of St. Mark, signifying the alliance between Venice (defender of the holy relic, the skeleton of St. Mark) and the Holy Church in Rome. 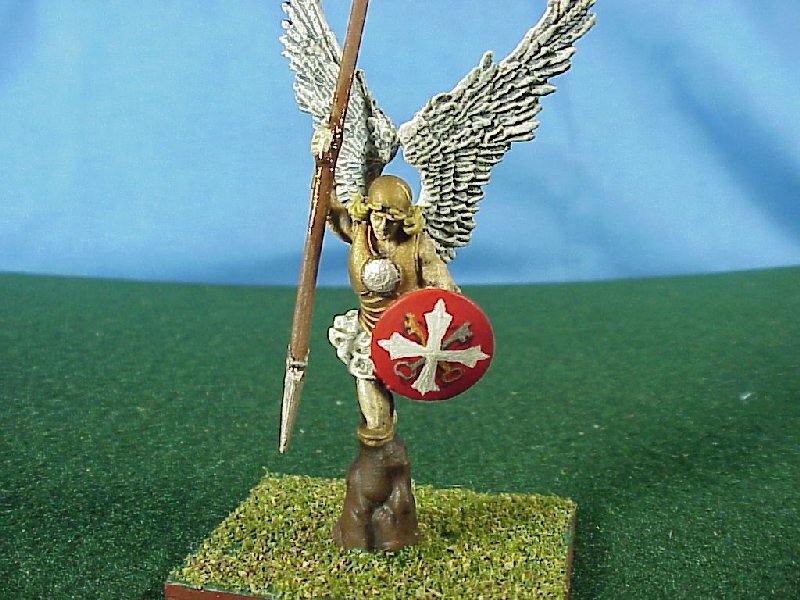 Triumphant and Majestic on the battlefield, the Holy Church has the rare privilege of calling upon the greatest of the Lord's Angelic Host to fight at their side, though the cost of his arrival makes his use somewhat daunting. His shield is the only one with the honor of bearing the Pisan cross covering the keys of St. Peter. 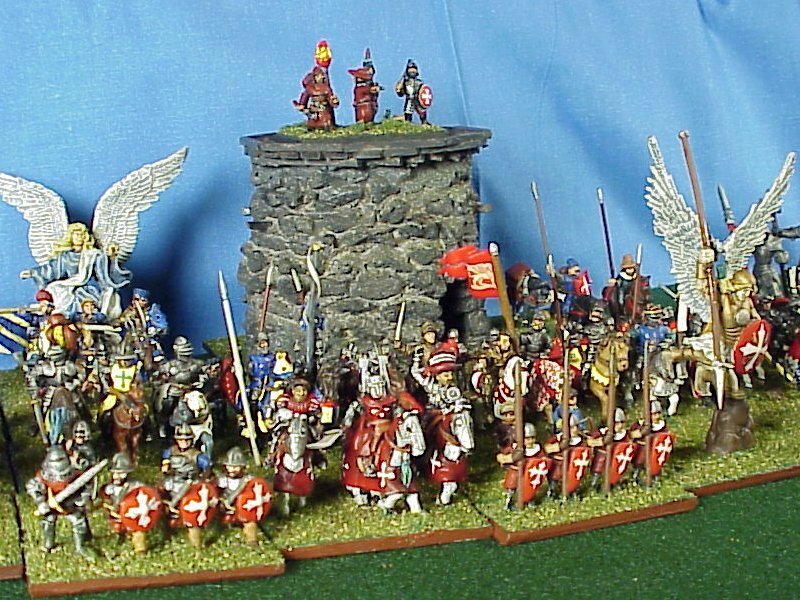 The figure is actually half of a 2-figure diarama from Thunderbolt Mountain Miniatures, separated from his demonic opponent and mounted on the tip of the rock stand. 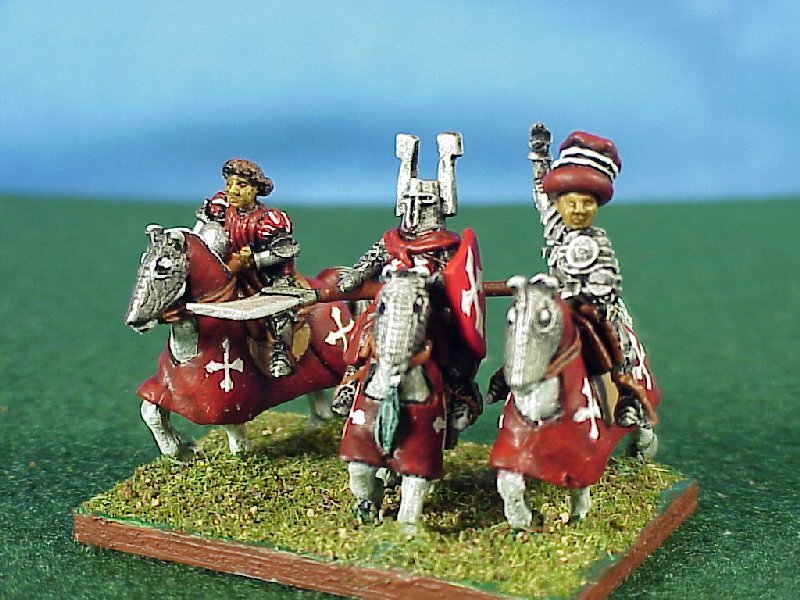 A recent addition to the army, the Paladin wears the crimson and white of the core Papal army, but his countenance and bearing set him far above the remainder of the knights in the order. 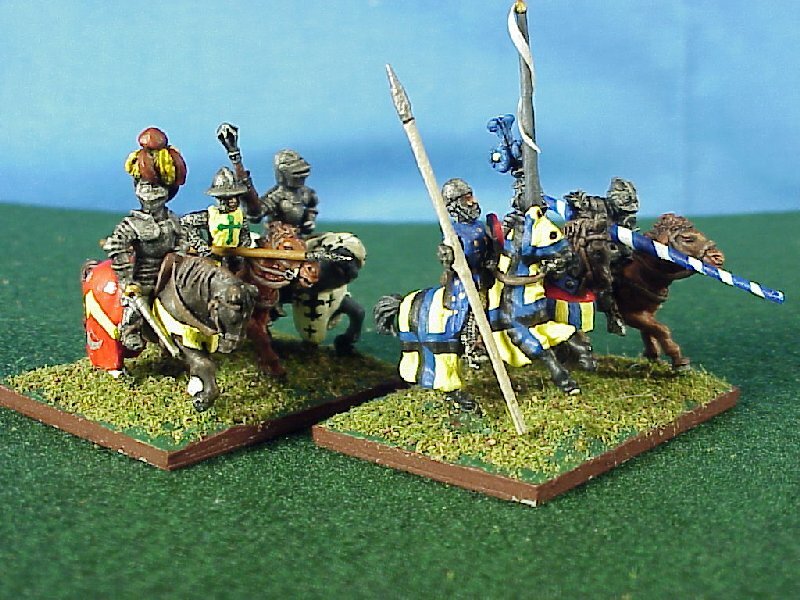 The figures are all Mirliton, combined from a leftover command pack and one of the Teutonic Order. The weapon the Paladin wields is similar to a celtic falx, or perhaps a late-era halbard. 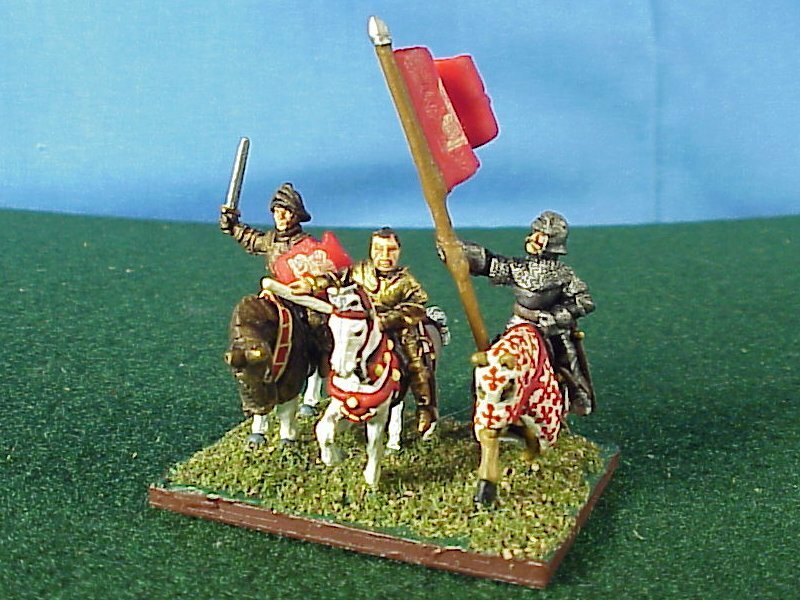 Unfortunately, though the riding pose of the figure is fantastic, the length of the polearm made mounting the figure problematic, forcing the odd position of the squire. 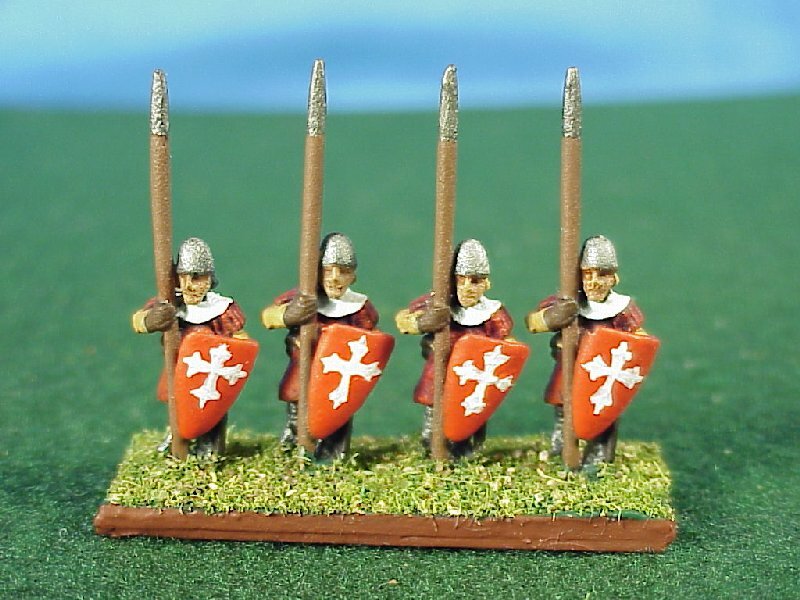 The mainstay force of the Papal army. 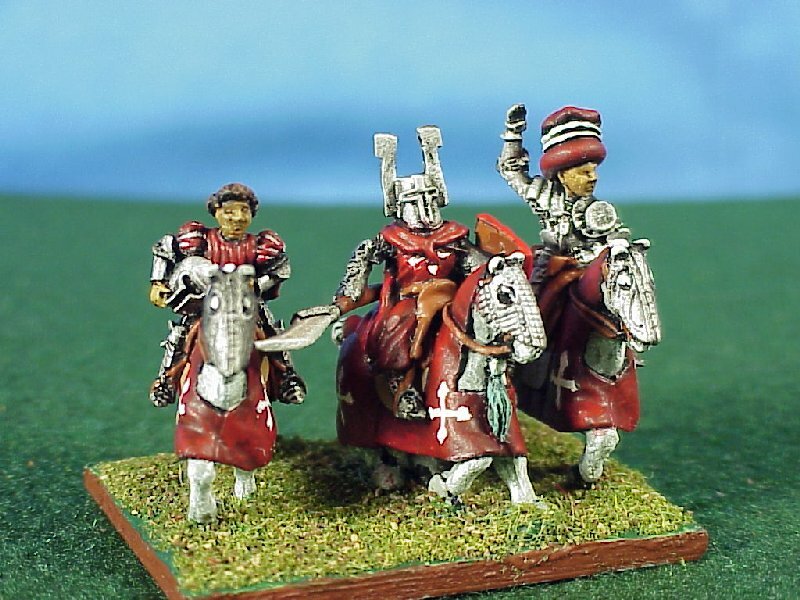 These mercenary knights serve the church either for a share of the spoils of conquer or for indulgences absolving them of their sins. Absolution is big business in the world of Papal politics. 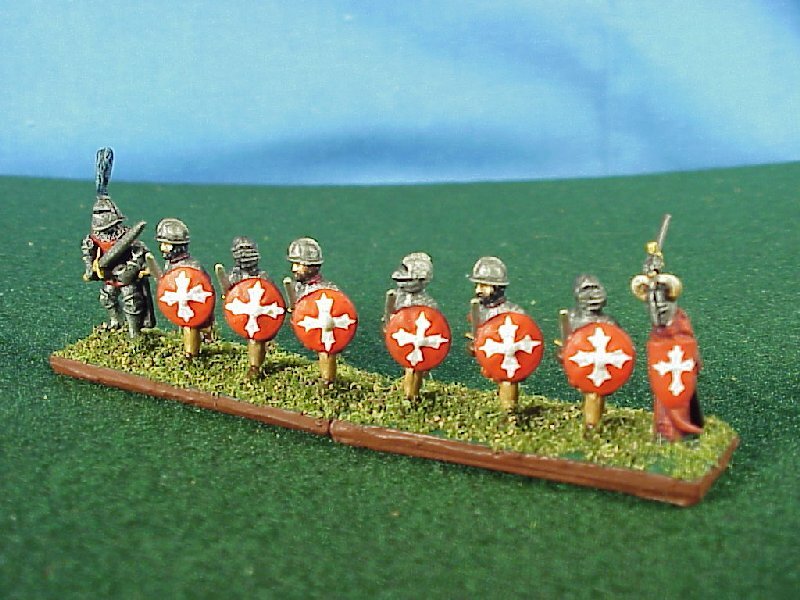 These dismounted infantry bear the signifying cross of the Papal state (adopted from the cross of Pisa after the forming of the Papal Alliance.) 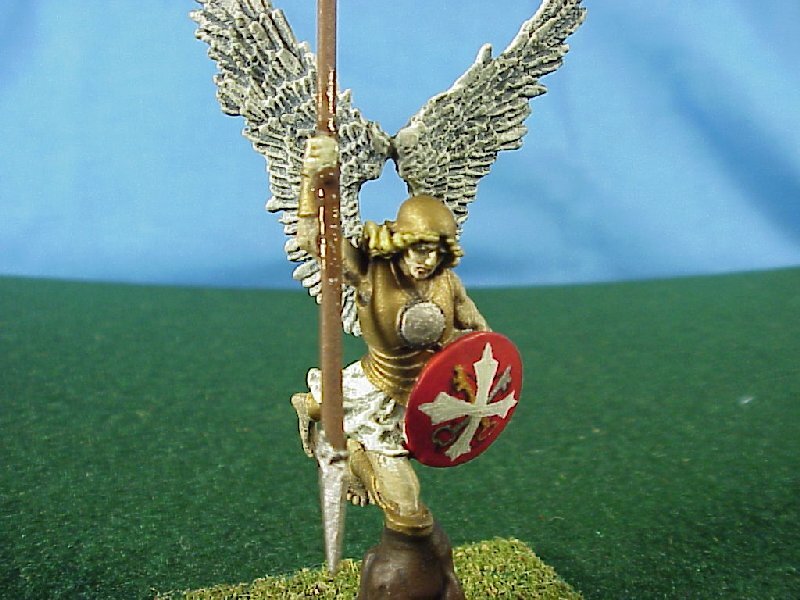 All troops under the Papal banner are permitted to wear the crimson and bear the Pisan cross, but only special troops (like the Aerial Hero below) can bear the keys of St. Peter. Similar in constitution to the dismounted Blade units above, these troops are fanatic guards of the Basilica Roma. 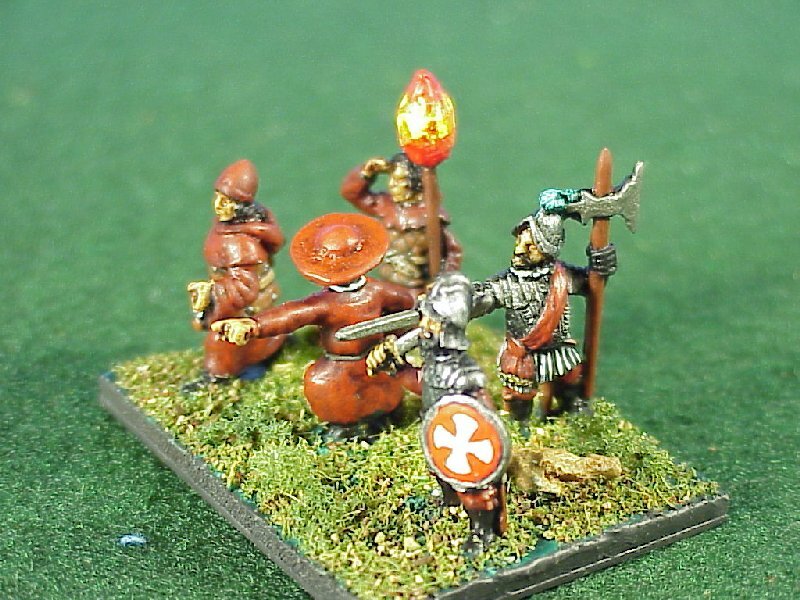 Being only a single element, they seldom get used, but I had the figures primed for another army and decided not to use them, so suddenly they were impressed into Church service. Unlike most of the rest of the Papal army, the Friar St. Dominic (in this fantastic age, people of great piety are often canonized while still alive) bears a power greater than the rest, the power of faith. 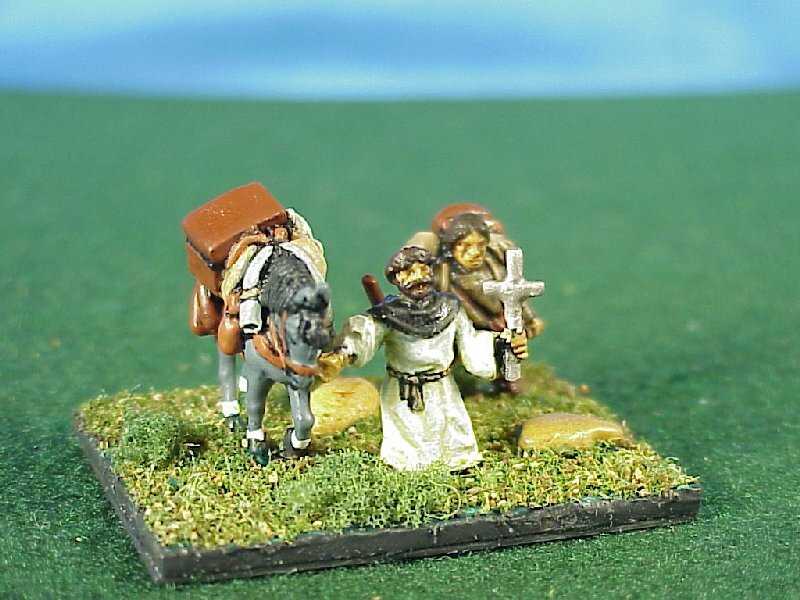 Of course, the fact that his pack animal and acolytes are weighed down heavily with provisions has nothing to do with his popularity among the troops. 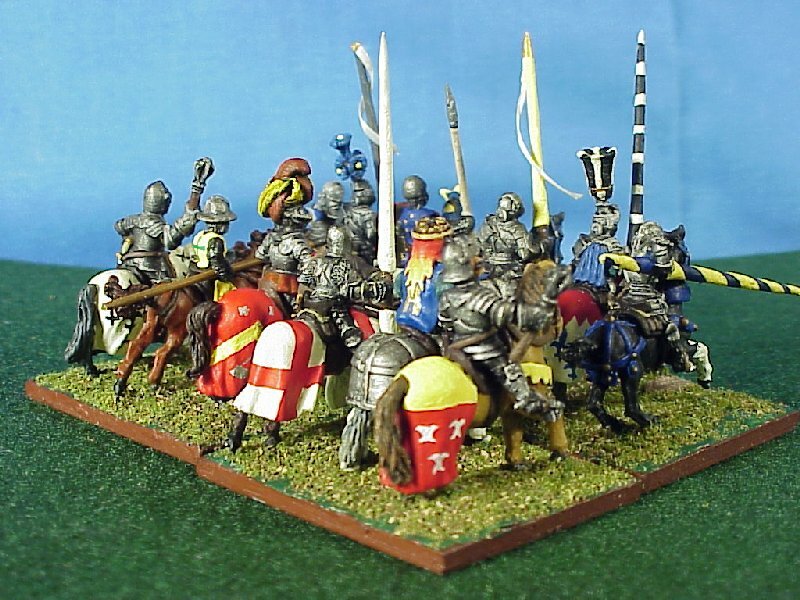 The figures are all Essex, from a variety of packs. 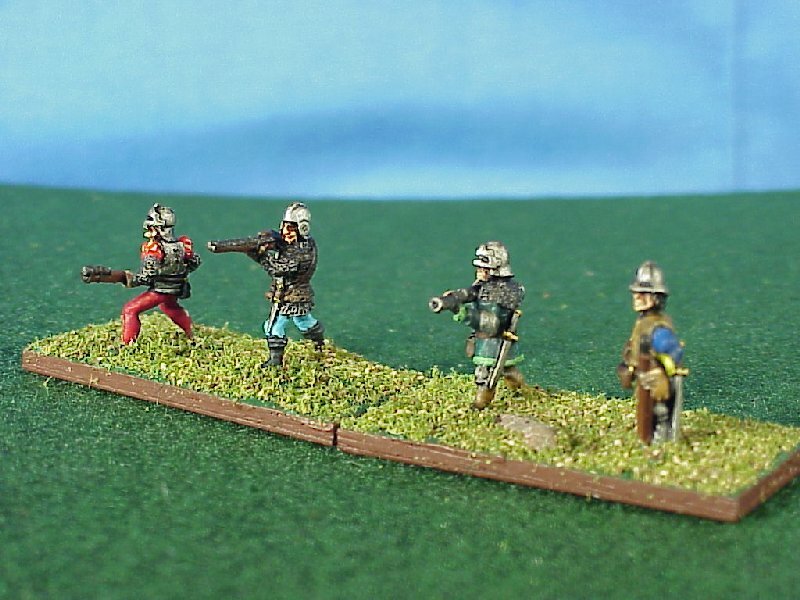 The figures are all Essex, both the Spaniards and the fanatics. 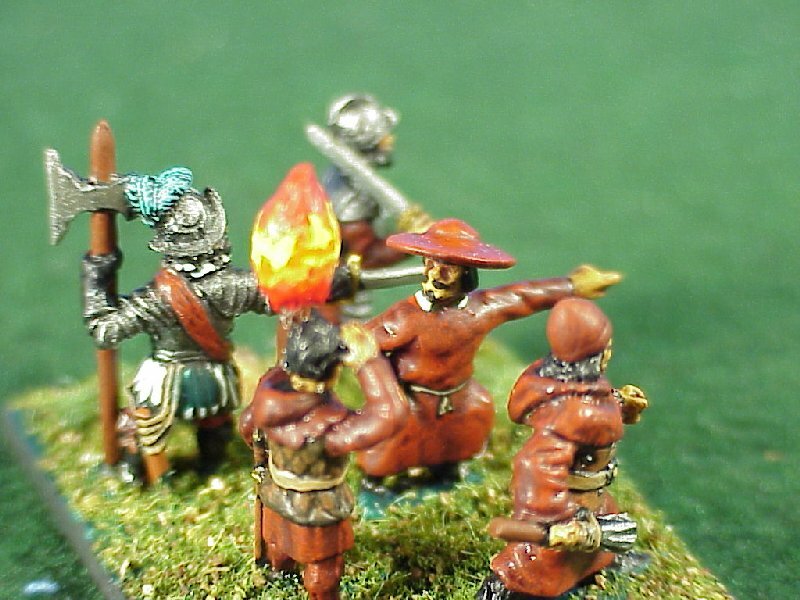 The Inquisitor Majoris is, in fact, the same figure as was used in the alternate camp for the Italian Condotta. The hat and the lengthening of his robes were accomplished via 2-part green putty, as was the addition of a clerical collar. 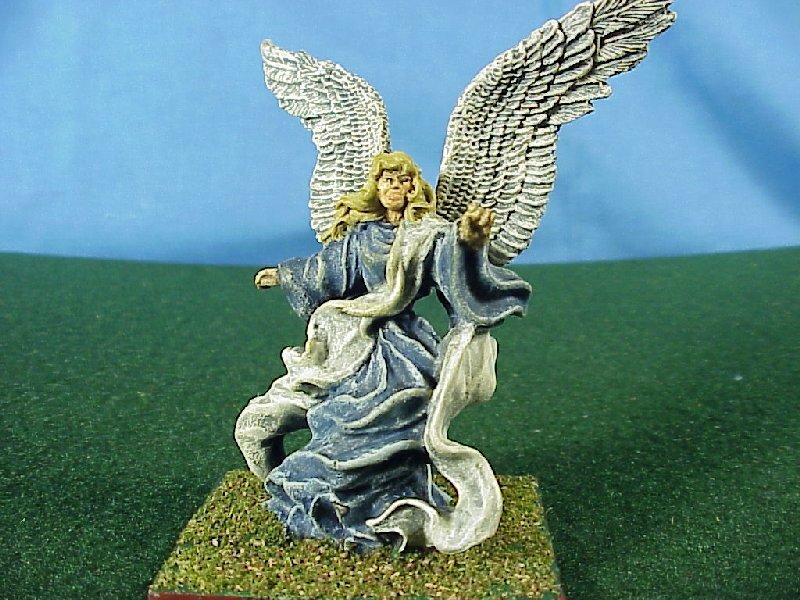 While not typically used as a Magician, the ethereal nature of the Angel of Mercy and her ability to bring peace from afar to the battlefield make her an ideal choice. Her beauty can entrance even the best of Heroes and pacify the most savage of beasts. 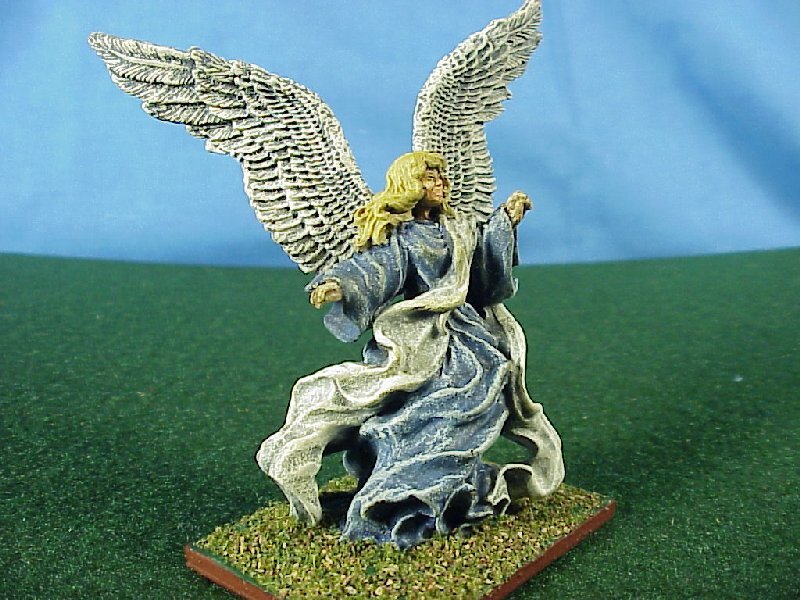 The figure is a Reaper miniature. The army of the Church fields a few divisions of weapons specialists utilizing the most advanced projectile system of the day, the Handgun. It was widely known that no troops in medieval times were better acquainted with the power of prayer than the Handgunner. 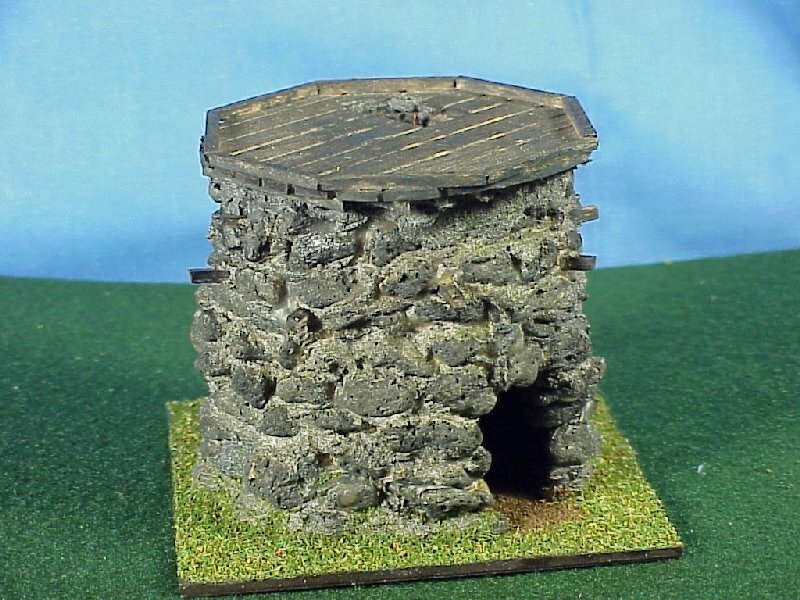 This simple stronghold is rumored to be the reliquary for some of the Holy Church's most powerful items. Whether or not this is true, it seems to come under attack more often than not. 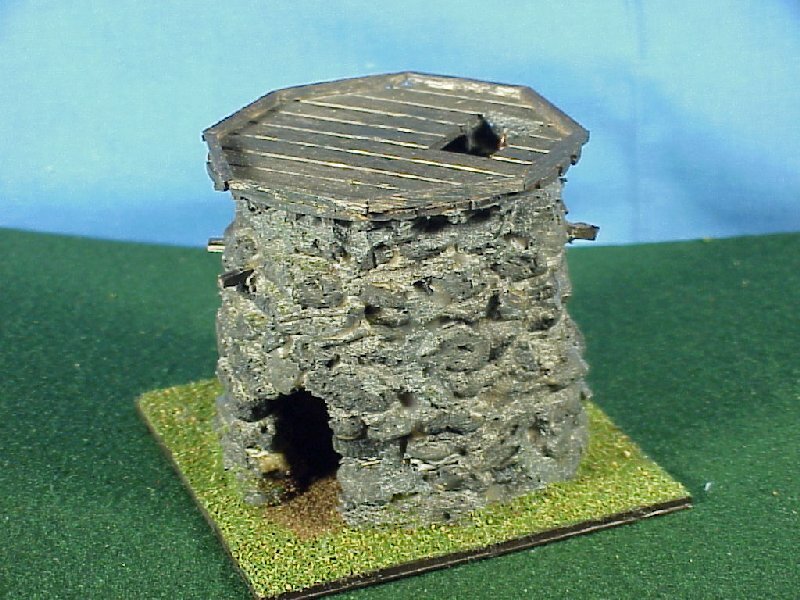 The Stronghold is scratch built from railroad Talus, layered a level at a time with modeling paste and epoxy. The wooden bracing at the top was hand-built using balsa sticks. The ladder on the inside is from an Essex pack.